Is It Time to Sound the Alarm on Artificial Sweeteners? To cut calories yet keep the sweet taste, non-nutritive sweeteners (NNS) are a staple of some people’s diets. But the overall effect of NNS on weight loss still isn’t fully understood, with some studies pointing to a bit of weight loss, while others show a neutral effect or even weight gain. The effect is probably highly dependent on the specific person using the sweetener. It turns out that artificial sweeteners have been correlated with enhanced appetite and increased hunger that tends to increase food consumption and lead to weight gain, and this has been known since the 1980s. Connections also have been made between artificial sweetener intake and increased risk for metabolic syndrome . But this is just correlational evidence, and those using the largest amounts of NNS may simply have a predisposition for overeating and weight gain. Another school of thought is that somehow sweet taste in the absence of calories is causing people to eat more food elsewhere in their diet. But how would this work? Researchers hypothesized that the physiological response to sweet taste may be coupled to the energy content of food, and that disrupting this balance could wreak havoc on appetite control and energy homeostasis. Although a promising idea that seemed to be consistent with evidence in animal models, lack of any known mechanism kept the concept at the theoretical stage. Although they lack the calories of sugar, the overall impact of non-nutritive sweeteners on body weight isn’t fully understood. A recent study looked at the specific mechanisms that might play a role. To examine the connection between NNS and weight gain, fruit flies were the go-to model. While this may seem to have questionable relevance to humans, fruit flies have some big advantages as an experimental model. They are easy to genetically manipulate, have short life-cycles, and are cheap to keep in the lab. Moreover, they have systems that sense the sweetness and caloric content of food and even have some of the same insulin signaling and taste-reward pathways that are present in humans. The flies were fed a sucralose-sweetened diet for 5 days, which caused an increase in food intake that returned to normal only after removal of sucralose from the diet. Sucralose also increased the sensitivity of these flies to sweet taste, which again was a reversible effect. To rule out the possibility that it was some property of sucralose, and not sweet taste in general that was causing this effect, the researchers used L-glucose, another non-caloric agent that tastes sweet to flies. L-glucose had the same effect as sucralose, confirming that sweet taste in and of itself was leading to increased food consumption. The sucralose-fed mice also exhibited impaired glucose homeostasis, were hyperactive and had fragmented sleep, effects which also have been reported humans in connection with aspartame, another NNS. Fruit flies fed sucralose showed a variety of negative effects, including increased food intake and altered glucose homeostasis. Having demonstrated that sucralose increases appetite in the flies, a key question remained, was the effect of sucralose on the flies due to sweet taste itself, or due to an imbalance between sweet taste and the actual energy content of food? To answer this question, experiments compared sucralose head-to head with regular table sugar (sucrose). While sucralose increased food intake, sucrose, which also tasted sweet to the flies but contained calories, decreased food intake. This suggested that sucralose increased food intake by creating an imbalance between sweetness and calorie content. If this were the case, supplementing the sucralose fed flies with an additional agent that has calories, but no sweet taste might restore the balance of sweetness vs. energy content, negating the increase in appetite. This is precisely what happened when researchers gave the sucralose group sorbitol, a sugar alcohol that contains calories but does not taste sweet to fruit flies. Taken together, these results pointed to the conclusion that decoupling sweet taste from energy intake increased appetite and food consumption. But what was the mechanism? Through an additional series of experiments the researchers found that long-term ingestion of sucralose-sweetened food in the flies activated the enzyme AMPK in the neuronal system, which caused certain cells to produce NPF, a neuropeptide that promotes hunger. This same signaling pathway was activated by fasting, indicating that the consumption of synthetically sweetened food created a sweet taste vs. energy imbalance that mimicked the effects of fasting on the brain. Experiments in mice mirrored results in the flies. 7 days of sucralose consumption in mice significantly increased food intake. 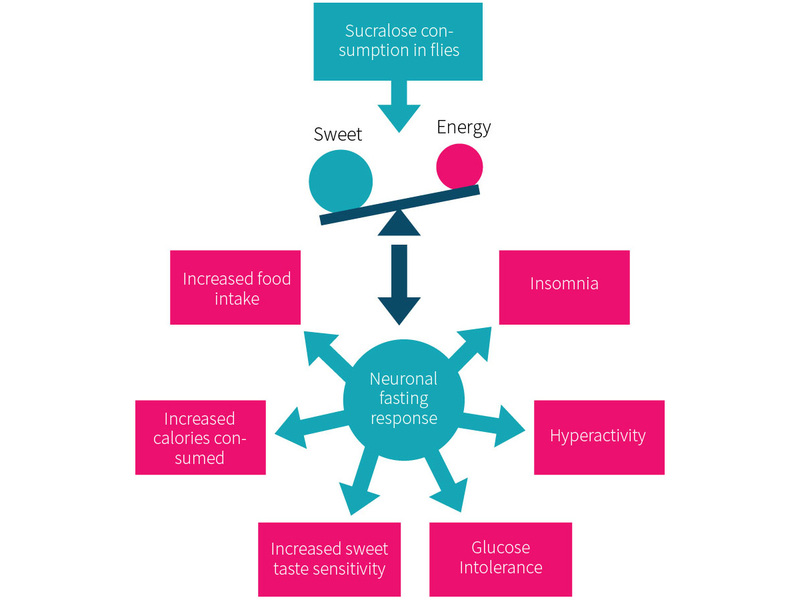 This failed to occur in transgenic mice lacking the NPY neurotransmitter (the mammalian homolog to fruit fly NPF), indicating that from flies to mammals, decoupling sweet taste from the energy content of food can induce a neuronal fasting response that conspires to increase appetite and food consumption. Experiments in flies and mice showed that sucralose can increase food intake, through creating an imbalance between sweet taste and energy intake. 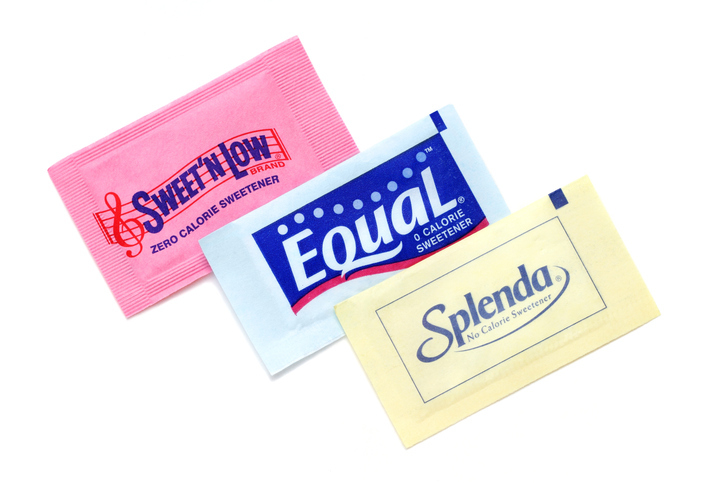 So … is it time to sound the alarm on artificial sweeteners? Evidence from the Wang et al study suggests that creating an imbalance between sweet taste and calorie influx could weaken the ability of sweet taste to be perceived as energy intake, instead triggering a contradictory fasting response that increases appetite. In other words, not unlike “The Boy who Cried Wolf”, chronic intake of non-nutritive sweeteners could create a situation where the brain no longer ‘believes’ that a sweet taste is connected to an influx of energy. If this occurs in humans, it raises the possibility that those using lots of artificial sweeteners could be at risk for unintended weight gain. 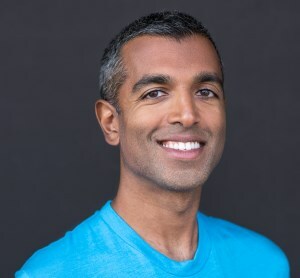 While this idea is in line with the earlier published studies connecting NNS intake to increased appetite and weight gain in humans, it is a hard one to prove. Since the ethics of transgenic NPY-knockout human studies just aren’t there, the mechanism uncovered by Wang et al has yet to be validated in human subjects. The fact that this novel ‘neuronal fasting pathway’ that integrates hunger, sweetness, and the nutritional content of food is intact from fruit flies to mammals does suggest that it may be time to wave the caution flag where NNS are concerned (after all, humans are mammals!). It is important to emphasize, though, that human studies on NNS and appetite regulation have reported mixed results. This suggests that some individuals may be more affected than others (if at all), and at this point we can only speculate. A Splenda or two in your daily coffee probably is not an issue, but we need to take a closer look at the effects of chronic, high-level NNS intake in certain populations that may be more predisposed to obesity or metabolic dysfunction. Decoupling sweet taste from the normal ensuing influx of energy, if it occurs with NNS use, may undermine the ability of some (although specific vulnerable populations aren’t known) to control food intake. NNS-induced increases in appetite could go unnoticed, leading to unexplained weight gain over time. This page features 16 references. All factual claims are followed by specifically-applicable references. Click here to see the full set of references for this page.